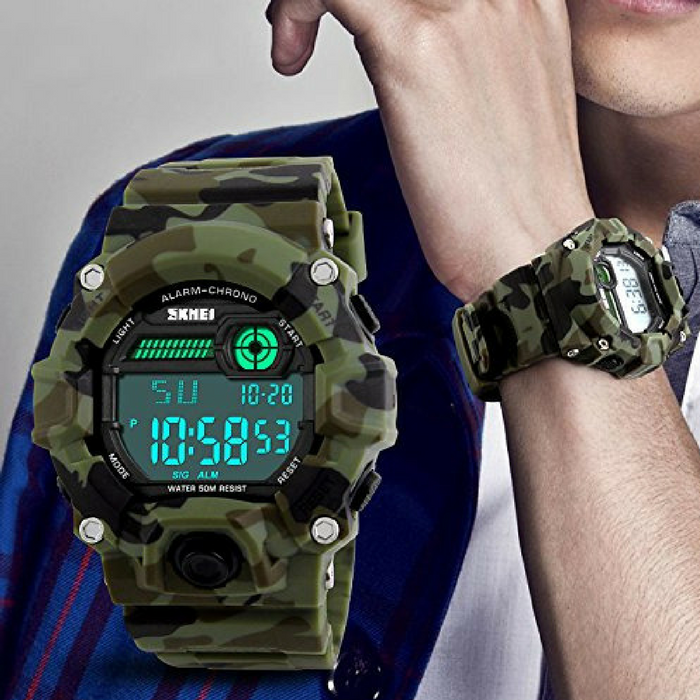 Boys Camouflage LED Sport Watch Just $13.59! Down From $59! You are here: Home / Great Deals / Amazon Deals / Boys Camouflage LED Sport Watch Just $13.59! Down From $59! At Amazon, you can score this #1 Best Selling Boys Camouflage LED Sport Watch for just $13.59 down from $58.99 PLUS FREE shipping with Amazon Prime or for orders over $25! This sport’s watch is fashionable, very charming and perfect to wear for all occasions. It’s an amazing looking watch which makes a great gift for family and friends especially this holiday season! Multifunction: Light,Stop Watch,Waterproof,Shockproof,Calendar,EL Backlight,Alarm Clock, this sport watch is perfect fit with all kinds of sports and it’s really an everyday watch. Waterproof: 164 Ft / 50 M water resist, Support to swim and bathe in cold water. Please DONOT press any buttons underwater, and in case of damaging waterproof ring,please keep it away from steam and hot water.